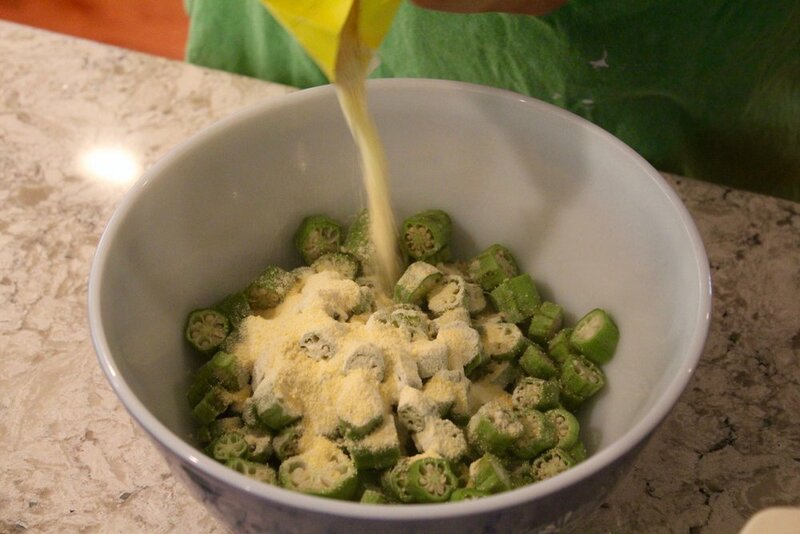 In a strangely late rite of passage into my Southern family, I finally learned how to "wheel" okra. First, we cut, or "wheeled" a whole mess of okra; a lot of it. Cutting it into small circles and watching the inner pods leak jelly-like tears from within the fibrous pod. Okra has always intrigued me, and it took me a while to come around to it. It was always this prickly, strange vegetable, gelatinous once cut. The only ways I had encountered it for years was in a ceramic dish, haloed with paper towels after being fried up to crispness in cornmeal; the popcorn of the South. The history of okra and its intertwining with Southern cuisine is complex, as noted in this article on Serious Eats. The plant played a large role in the evolution of Southern-style gumbo, with origins deep-seated in West African cuisine. Okra also provided a summer staple food in the South, due to its tolerance of heat. But Southern U.S. cuisine does not, by any means, hold a monopoly on cooking with okra. Recently, I came across the familiar pod in a spicy bhindi dish at an Indian restaurant near where I work, accompanied by a pile of fluffy basmati rice and spiced chickpeas. Enjoyed out of a carton on one of the swampiest, hottest days of the summer, I really felt the fire behind my eyes. It opened my tastebuds up to an entirely different way to experience okra's texture; as a smoother blend of the vegetal and the truly spicy. Then, we coated it in cornmeal -- ideally, white self-rising cornmeal. In this case, we used yellow, which my aunt had at hand. We also accompanied it with some fried potatoes, Vidalia onions and squash, also coated in a layer of cornmeal to be fried for a vegetable-forward summer meal. We fried these all up on the stove -- the local bounty made crispy and crunchy for our plates. The results were a classic Southern summer night: a plate full of vegetables, a thickly sliced tomato with a few cranks of pepper, a glass full of iced tea, and maybe if you're lucky, some cornbread on the side -- served with local honey from my uncle's hives. One of my goals is to explore my food heritage a bit more, looking to the ingredients that have nourished each side of my family for years. The seasonality and closeness to nature that have shaped my experience of Southern food have always made it one of the most comforting, appealing expressions of family that I have known. By learning more about different ingredients and different cuisines, exploring different cookbooks and restaurants, I hope to become more familiar with the foods that surround me everyday. With each bite of spicy bhindi and each crunch into a crisped round of wheeled okra.